May 9, 2018 at 3:36 pm EDT | by Lou Chibbaro Jr.
Employees, managers, and owners of the D.C. gay bars Town Danceboutique, Trade, and Number Nine organized an election committee earlier this month to oppose a June 19 ballot measure asking voters to decide whether the so-called “tipped wage” exemption should be eliminated. 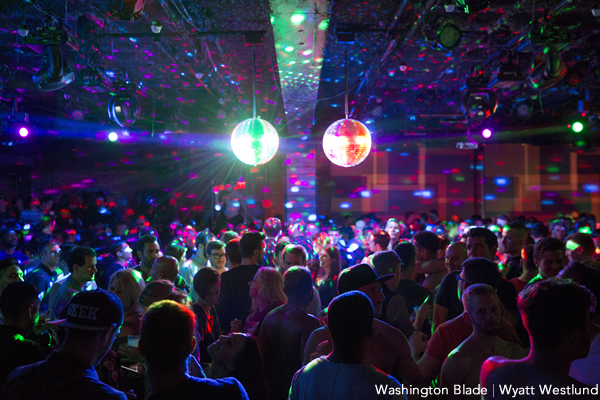 Other D.C. bars, restaurants, and nightclubs across the city quickly joined the committee, called NO2DC77, according to gay D.C. nightlife advocate Mark Lee, who is serving as a consultant to the committee. The ballot measure, called Initiative 77, calls for ending an exemption to the city’s minimum wage law that allows employers of tipped workers to pay them less than the prevailing minimum wage. If approved by voters, it would require all tipped workers to be paid the full city minimum wage as part of their base pay. NO2DC77 points out on its website NO2DC77.com that existing D.C. law requires restaurants, bars and other employers of tipped workers to pay tipped workers the difference if their tips fall short of the full minimum wage, which is currently $12.50 per hour. Under the existing tipped wage exemption, employers also pay tipped workers a lower minimum wage of $3.33 per hour. “It is extremely rare for tipped workers to not earn incomes that are significantly higher than minimum wage, and the tip-wage system allows them to retain great earning potential,” NO2DC77 says in a May 4 statement. “Tipped employees at the city’s nightlife establishments know that outlawing the tip-wage system will reduce their incomes, as well as result in staffing cutbacks and reductions in shifts and hours,” the statement says. “Jobs will be lost, consumer prices will skyrocket, venues won’t survive, and the economic foundation of D.C.’s vibrant and dynamic nighttime economy will be shattered,” the statement concludes. Lee said that because LGBT people make up a disproportionately high percentage of tipped workers in nightlife establishments, they could be among the most to be adversely impacted if the initiative passes on June 19 in the city’s primary election. Supporters of the initiative, led by the Restaurant Opportunities Centers United, or ROC United, dispute restaurant industry leaders’ claim that forcing them to pay tipped workers the full minimum wage over and above their tips would create a severe economic hardship in D.C.’s highly competitive hospitality industry. ROC United officials also dispute claims that the large majority of tipped workers earn more than the minimum wage, saying servers in smaller venues that are not high end “white tablecloth” restaurants often make less than the minimum wage. The group has also launched a campaign highlighting what it says are studies showing that female tipped workers are subjected to sexual harassment to a far greater degree than females who work in other professions.